Conley was beginning to wonder if he’d made a serious error… Pouring his own magical powers into the gate system had indeed sent him far beyond the reach of the secret police – but he seemed to have miscalculated and sent himself out of the usual array of inner planes altogether. Was the blasted imperial gateway network using something beyond normal magic? In any case… This miserable place was low-magic, limited technology to the early bronze age, apparently had nothing in the way of elemental or draconic forms to take – in fact, the elemental planes seemed to be virtually sealed off – and apparently even limited psionics to relative trivia (not that he had much skill along those lines anyway). Even the local spirits were pretty low-key. OK, the climate was fairly comfortable, and the pastoral locals had plenty of goats, sheep, grapes, figs, beer, wine, and bread to eat – but he’d had enough of that within a week. There had to be SOME way to get back to some sensible dimension! It had been easy enough to take the role of a wandering wise man or seer – his medical skills were far beyond what little the locals knew – and that let him start tracing legends. Every realm had at least a few gates – otherwise he couldn’t have gotten into it in the first place – and in a realm with so little magic, the forces that leaked through such gates would surely inspire legends. He’d found one eventually – a place called “Bethel” where the locals were talking about building some sort of temple. It was a gate of sorts – and even if it did seem to lead to some sort of pocket-realm who’s inhabitants were trying to establish some sort of mythology featuring themselves as the representatives of some a unique supreme being. Humph. Everyone – well, everyone in more sensible universes – knew that “gods” were just really powerful extradimensional beings. The nerve of these things, trying to pass off a fraud on such a scale… Most of the stories sounded like a high-powered weather-spirit. Still, at least the realm they were working from seemed to have a reasonable amount of magic available. All he’d have to do was access it – and he might even be able to sabotage their little game a bit at the same time. It took Conley some time to attune himself to the gate enough to pass it – but he was a potential Opener, and his uncontrolled power rippled across the realm he was stepping into, causing temporary reality warps. He’d prove that this omnipotent being did not exist if he had to shift his way through half of “heaven” to do it! Overgrown spiritual conspiracies, overgrown psychic entities, and egotistical extradimensional aliens did not count! People should just go on and do things because they believe they can, not because some entity was tricking them! Kevin unloaded the oddly-selected pile, leaving Menthas watching with some bemusement. The pair seemed to mean well, but they also seemed to have no sense at all… At least they hadn’t put anything too outrageous on their list. She accepted graciously – although, as an angel, she was hardly capable of being ungracious. Right about them a dimensional overlay rippled through the area – leaving the area a tangle of realities, bathed in a brilliant white light, and with a strange hissing coming from the sky. The hissing reached a crescendo – followed by an enormous BANG. Suddenly the lights went out across the realm as the sun went out – and the sound of numerous angels yelling angrily arose in the distance. Kevin started probing. He wasn’t much of a diviner, but this wasn’t too subtle. Marty was busy trying to hide that he was actually somewhat impressed with the intruder’s cheek. It took guts to rush into a heaven full of warrior angels and pull this kind of nonsense! Even Kevin was somewhat nonplussed! Conley was feeling right at home! He’d just shown that the entire place was a complete farce; even their so-called Sun was actually just a giant lightbulb! It did look like accidentally breaking it in the process had annoyed the locals, but being pursued was making him feel right at home! Marty headed over that way. Hopefully they wouldn’t knock the guy out before he could ask him how he did that! Marty, still in his “Krishna” Identity, intercepted the parade at that point before they all drifted off into the Monty Python or Benny Hill heavens. It was too silly! He was going to put a stop to this sketch right now! (Kevin, to no one in particular) “Hm… Another Opener? About time! We’ve only run across… one for sure and a couple of ‘maybes’”. This guy was obviously either an atheist or an irreverentist like you found back in Battling Business World. Still, he wanted to know why he’d done that! Conley started as a multiarmed blue thing appeared in front of him. He wasn’t sure as to it’s intentions, but it certainly hadn’t featured in any of the tales he’d heard of this so-called “Jewish Heaven”! Conley headed straight for the blue thing – it was blocking the way anyway – and shifted to ferret-form at the last moment to run under it’s legs – easily zipping past the blue thing. Whoa! He was a slippery one! Even for a ferret! If he hadn’t managed to startle him, he’d have gotten clean away! Conley considered turning into a mammoth or elemental – but that wasn’t all that good for losing pursuit. Still, it was only three minor “angels” and no more approaching at the moment. It might be worth trying to debate this thing! He started expanding very slowly, preparatory to going back to his near-human form. (Marty) “Yeah, tell me about it. You would not believe this Jewish guy I work with. Mitzvot this and kosher that. Geez.”) What are the angels doing? The “angels” (ah, mostly phantasms of the overlay) were demanding an apology and that he fix the sun – also part of the overlay of course. Conley slipped out of Marty’s relaxed telekinetic grip in favor of getting in the “angels” faces and arguing loudly. Kevin was busy offering Conley ferret treats and more ferrets to play with! Marty let him go, since he seemed to be more focused on arguing than on running. What, it was polite to twist the local reality and assail the very fabric of existence, but not to knock people over? (Conley, to Marty) “Oh, I have plans for them! He didn’t really. What, were those other departments of this fraud-operation or something? That was impressive! There weren’t many people who could enunciate quotations and capitalization’s like consonants! The Overlay-Angels produced a twenty-ton lightbulb for the repair work. It was easy enough to get the lights back on, especially since the overlay was rapidly starting to fade. It was difficult to tamper with such an old, well-established, and well-supported realm for long. What, “Angels ate my homework”? People had never needed any excuse to stick with whatever it was they found comfortable and familiar. Kevin sighed and pointed at the chairs, the therapy sessions, and the route to the medical lectures. Kevin promptly had his current pocket-companions turn back into young women to debate their contracts with Conley. He’d been getting bored with that pair anyway, so it was time they had a new assignment in any case. That did divert Conley temporarily, if only because he could see that there wasn’t anything else around that he was going to have to get involved in immediately. The two girls were pretty firm on their points; they had a contract that they were actually willing to show him. They belonged to “Lord Sanwell” until they managed to make all the powers that he had bestowed on them fully their own. They had plenty of time to do that because those powers included immortality and perpetual youth. Now that HAD to be the biggest fraud he’d ever seen! (Conley) “Uh huh. And how do you make immortality your own? You either are immortal or you aren’t. As for perpetual youth… that’s something he can’t deliver. Even if he can keep you from aging physically – and that’s a pretty big IF – he can’t prevent you from getting older, learning more, and becoming more than you already are. So it’s a false promise. 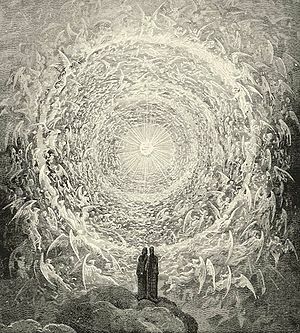 The Angels seemed to have settled down to watching the debate, although Menthas did seem to be enjoying it. So, for that matter, was Marty. Debate still wasn’t really his thing, but it was rare to find someone who could debate with Kevin and his Thralls on equal terms! That took Conley a bit back again. There were established qualifications for being a “Dark Lord” in the dictionary? Some sort of checklist? What kind of religion WAS this? Menthas, meanwhile, was laughing and enjoying the debate – although she didn’t mind them leaving to keep an eye on Conley either. She wished them all well. The girls popped back into ferret-form and headed for Kevin’s pockets again. Kevin and Marty started quietly herding Conley off towards the medical lectures. They needed to pick up Mrs Eight-and-a-Half. Oh yes. Conley wouldn’t know most of the Manifold terminology would he? At the lecture area, Raphael was continuing to lecture the class on medical techniques. Istral had taken to watching the classes and participating in the lessons. Raphael noticed their approach and called for a break from the lesson for a few minutes. (Kevin) “And I’m pointing out that you’re equating “supernatural” with “cannot be explained”. The rest of the universe tends to define it as “effects which cannot be produced by mechanistic means in the one-and-only natural universe” – or, more locally, as “effects that cannot be produced within a particular universe without the intervention of an ensouled operator who can tap into the local laws and energies of normally-disconnected realities”. Marty had Minel whip up drinks for everybody. He was beginning to see the scholars viewpoint! This was like a knife fight, but with words! Thrust, parry, evade, slash, entrapment, feints… it was all there! A bit slower but more intricate, and with a wider array of hidden facts than anyone could normally carry in the way of weapons but fewer underhanded options, but the basic dance of combat was there… Was this duel of words what Core had substituted for physical combat? Suddenly that was a bit chilling. Ideas had always been more deadly than any mere physical weapon – and out in the Manifold, that could be very literal and immediate indeed. Kevin channeled a burst of Mana through Conley. Marty put some in too. That world sounded like a lot of fun! A gateway in space and time opens before them, as power was channeled through the thought construct – creating a link and opening a doorway to a world imagined only moments before. They stepped through after Conley and closed the portal – although they did take care to tell Istral that this would just be a brief side-trip. Conley, meanwhile, was busy trying to poke holes in the “illusion”… The landscape before them was a teaside resort. The rim of the cup is visible as a bowl around them, mountains of tea-cake and sugar mines could be seen. A light (and rather sticky) rain of milk and honey had begun. There were solid sugar rocks, crumbly cake for soil, and sticky icing slopes… Ah! There were some toast-and-marmalade shales! Marty – back to his usual plump, short Brooklynite businessman form – was going diving. The rest of the people in the resort were somewhat more reserved, and were all sporting British accents. (Conley, who was busy testing walls that hadn’t been in view a few moments before…) “Sure. Fine, a cup of tea would be nice… Hey, wait a moment! What happened to the wings and halo? Or to all of his (jerking a finger at Marty) extra arms? Conley wasn’t paying too much attention to that… Although he did note that there might be some communications difficulties resulting from their apparent use of a specialized jargon of some sort rather than the definitions he was used to. Some of the phrases they used seemed to be almost… technical. He was too busy testing solidity, tasting a bit of the landscape, and otherwise poking around. This WAS a good illusion… but he hadn’t seen one yet that could stand up to all the senses he could manifest! Marty was loving it so far. English breakfast tea it was, with sugar and milk… Not at all bad! Conley was running through the full electromagnetic spectrum, checking particle radiation, analyzing chemical compositions, testing bonding and solidity, and listening in on various frequencies – including the subsonic groans of shifting-teacake substrata. Every test reported simply… reality. OK, not too nourishing a reality, and one with FAR too much sugar, but… reality. In fact, this Kevin and Marty character were apparently exerting their own powers to keep from getting too sticky – and were extending them to cover the fox-woman too. This illusion was VERY good. Still, he’d never heard of an illusion that couldn’t be broken. Meanwhile, Marty was completing his refreshing swim and cleaning up after it. Oh dear. This was “reality” to every sense he could dream up. If experimentation couldn’t show a difference… was there one? Kevin, meanwhile, was letting his pets gallop about – there was nothing like a ferret on a sugar rush! – and was getting tea for Istral. The other guests all seemed to be phantasms at the moment of course, but that might change eventually! Marty was talking with the staff, just to see if his unusual accent (for this world anyway) got him any special attention. Sadly, with the usual British imperturbability, it didn’t. And so they did – although Marty recorded the realm as a possible fourth planet for his godrealm. He could have his cake and eat it too! Istral – and Conley – already had enough to think about anyway.